Description: Following Val Kilmer's portrayal of the caped crusader in Batman Forever, the fourth Batman feature stars George Clooney under the pointy-eared cowl, with Chris O'Donnell returning as Robin the Boy Wonder. This time the dynamic duo is up against the nefarious Mr. Freeze (Arnold Schwarzenegger), who is bent on turning the world into an iceberg, and the slyly seductive but highly toxic Poison Ivy (Uma Thurman), who wants to eliminate all animal life and turn the Earth into a gigantic greenhouse. Alicia Silverstone lends a hand as Batgirl, and Elle McPherson plays the thankless role of Batman/Bruce Wayne's fiancé. I won't go whinging on about how bad Batman & Robin was. The film can be summed up in one word: crap. But I will however go on about how surprised I am at the vehement response Batman & Robin got because, in the end, it is no better or worse than the previous Batman Forever movie. Whereas Batman Forever irritated me so much that I wanted to walk out, I also wanted to walk out of Batman & Robin - but for different reasons. Batman Forever illustrated how good the previous Batman films directed by Tim Burton actually were and how director Joel Schumacher made a mess. Batman & Robin was, well, boring. In fact, it is merely Batman Forever recycled. Both movies even start with the same scene - with Batman suiting up. The city looks the same, the music score is pretty much the same, there's the same campiness, the same unfunny one liners, etc., etc. But I still don't get the furor about this movie. It's crap, alright, but so was Batman Forever. Watching Batman & Robin you can be forgiven for thinking that you are watching Batman Forever again. 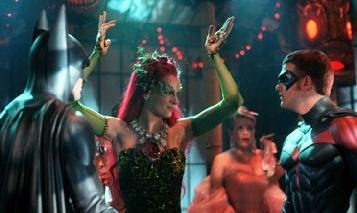 I didn't expect much from Batman & Robin and I didn't get much in return - in that sense the movie delivered . . .